Disclaimer: The following article is based completely on my own experiences, so I therefore strongly suggest you visit www.sg’s ‘Nightlife and Entertainment’ website for a much, much wider variety and selection of things to do of an evening. These guys are much more expert than me when it comes to night-time clubbing or shopping, and I’ve learned quite a lot studying up on their website for this article. As a tourist hub, Singapore is renowned for it’s shopping, nightlife and entertainment. Having said that, you don’t need to be a tourist to enjoy these benefits – you just need to ask my wife if you don’t believe me when I say that we live in a ‘shopper’s paradise’… and it’s always one of the biggest attractions for my Mum when she comes to visit. But Sammi and Mum’s tastes are world’s apart when it comes to looking for a bargain. 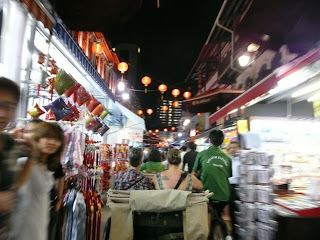 The markets are not just for tourists though – locals often frequent the 'Pasar Malam' (Malay for ‘night market’), which tend to move from location to location (usually close by major local shopping centres or housing estates), although the items for sale become a little predictable and the same if you attend these markets all the time (however the local food is always first rate if you want to experience the ‘soul’ of Singapore food - why does every article always come back to food??). For more of Singapore’s Nightlife, if it’s not the markets or shopping in which you wish to partake, then there is a huge range of pubs, clubs, nightclubs and other entertainment venues to choose from. 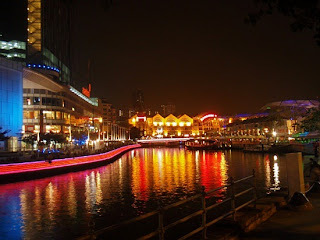 Whenever any of my mates come to visit, we always end up at Clarke Quay - a stretch of nightlife locations that offer up drinking, dancing, live music or any other number of activities to choose from. We also like to enjoy a beer or two on Tras Street, where there are a couple of local sports bars (we love to watch our footy, you know). If you’re on a big night out and not sure where to start, I recommend that you just head on down to Clarke Quay and embark on a good ol’ fashioned Aussie ‘pub crawl’…. Just see how far you get!! Or, why not just check out the options and information online for the expert’s advice at http://app.www.sg/where/14/Nightlife-and-Entertainment.aspx. The mind and body are strong, but the bank balance is O so week! Your wife loves big brands! !